Will Lightwork make a Mark? Author Simon Paul AtkinsonPublished on May 11, 2010 July 21, 2018 Leave a comment on Will Lightwork make a Mark? Why is it that whenever we want to reward academic staff, the incentive is to "buy yourself out of teaching” and at the very least “offload some marking”. Of course the answer is often that the alternatives are to remove yourself from service or administration (and the place grinds to a halt) or, God Forbid, let up on the research outputs. So teaching it is that is the malleable element and assessment all the more so. Shame. How do you really know if your teaching is effective if you don't see the results? How can you revise and improve your paper if you don;t complete that feedback loop for students? Of course marking can be a fairly tedious process, even a favourite movie gets tiresome after the twentieth viewing, but it's a necessary process and anything that makes it a little easier has to be a good thing. So I picked up this application here at Massey University called Lightwork. a development project led by Dr. Eva Heinrich, the desktop client intergrates with Moodle and its gradebook. 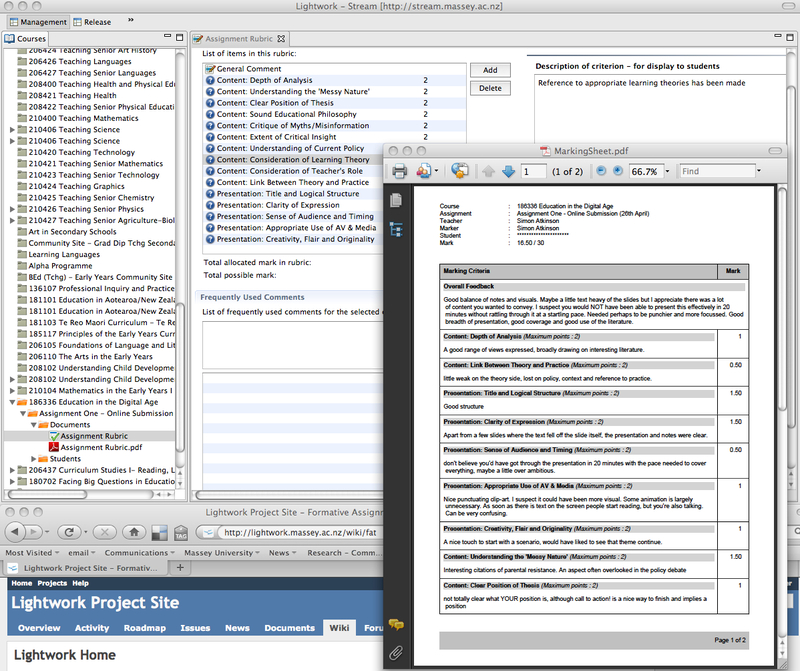 Once 'paired' the Lightwork downloads student details and allows the creation of marking rubrics and assigned markers, these are then synchronised back to Moodle so the end result is that approved grades in Lightwork are uploaded into the gradebook along with a PDF of the completed marking rubric. Well worth a look. I confess I'm playing in a paper with only 10 students, but just the admin time saved not having to save feedback forms under different student names etc, must be worth it. Published on May 11, 2010 July 21, 2018 Categories Tools and TechnologyTags Assessment, Lightwork, marking, Moodle, toolsLeave a comment on Will Lightwork make a Mark?